Tonsillar carcinoma is not easily diagnosed on [18F] fluoro-2-deoxy-D-glucose positron emission tomography/computed tomography (18F-FDG PET/CT) scan; normal, inflamed, and infected tonsils also exhibit increased tracer uptake. We present a case of a 68-year-old male with colon and prostate carcinomas who was referred for a PET/CT scan. He presented with right cervical lymphadenopathy which, on fine-needle biopsy, was found to have atypical cells suspicious for malignancy. On PET/CT, the right cervical lymph nodes appeared hypermetabolic; subsequent excision biopsy revealed metastatic poorly differentiated carcinoma. Increased metabolic activity was also seen in the tonsils, the right more than the left, which was initially ascribed to be inflammatory or physiologic. On magnetic resonance imaging follow-up, however, a more prominent and more enhancing right palatine tonsil was observed, which on histopathology was consistent with squamous cell carcinoma. Determining the maximum standard uptake value ratio between the two tonsils could have been helpful in differentiating squamous cell tonsillar carcinoma from benign asymmetric FDG uptake in this case. On a background of enlarged cervical lymph nodes and known primary carcinomas, uptake in the tonsils should be thoroughly assessed before interpreting it as an inflammatory or physiologic variant, especially if there is asymmetry in FDG uptake. The incidence of squamous cell tonsillar carcinoma is rising globally. Positron emission tomography/computed tomography (PET/CT) using 2-[18 F] fluoro-2-deoxy-D-glucose (18 F-FDG) is becoming increasingly important in the management of head and neck carcinomas, which typically appear hypermetabolic. However, inflammatory or infectious responses may look similar and thus can be mistaken for malignancy. Various degrees of increased FDG uptake are observed in the palatine tonsils due to its constant exposure to antigens, making an interpreting physician prone to making a false-negative reading. It is rare for a tonsillar lesion to be established as a primary carcinoma, especially in a person already with two carcinomas. A 68-year-old male was referred to us for an18 F-FDG PET/CT scan. He was diagnosed with colon and prostate carcinomas 1 year ago based on tissue biopsies. He subsequently underwent hemicolectomy and prostatectomy. No chemotherapy or radiotherapy was performed. Two months prior, he noted pain and swelling in the right lateral neck, only partially relieved by antibiotics. Ultrasound revealed either an abscess or a confluence of infected lymph nodes. However, fine-needle aspiration biopsy of the right cervical lymphadenopathy revealed atypical cells suspicious for malignancy. Serum carcinoembryonic antigen and prostate-specific antigen levels were normal, but serum amylase was elevated at 178.05 U/L (reference range: 30–110 U/L). A PET/CT scan was thus requested by his attending oncologist for further evaluation. Low-dose whole-body CT with slice thickness of 4 mm × 4 mm was performed for attenuation correction. Emission images were then acquired with a Philips Gemini TF 64 PET/CT scanner at 21 bed positions (90 s per bed position from head to mid-thighs and 20 s per bed position from mid-thighs to feet), 63 min after administration of a diagnostic dose of18 F-FDG. Fasting blood sugar was 75 mg/dL. Maximum weight-based standard uptake values (SUVmax) of the noted lesions were taken. Multiple hypodense and/or necrotic lymph nodes were seen in the right cervical area (Level II and III). The largest was at Level III, measuring 2.0 cm × 2.0 cm × 3.0 cm (AP × T × CC). Adjacent fat plains were not hazy. On PET, some of these nodes had increased FDG uptake, with the largest node exhibiting uptake mostly in the periphery [SUVmax3.9; [Figure 1]. Incidentally, there was increased activity in the tonsils, the right appearing more intense than the left [SUVmax5.7 and 3.8, respectively; [Figure 2]. No significant findings were noted elsewhere. Tissue correlation was suggested for the hypermetabolic right cervical lymph nodes. Tonsillar findings were said to appear inflammatory or physiologic. One month after the PET/CT scan, excision biopsy of the enlarged right cervical lymph node revealed metastatic poorly differentiated carcinoma; no primary carcinoma was favored, and immunohistochemistry was not done. Contrast-enhanced magnetic resonance imaging (MRI) of the neck was done soon after biopsy, with the right cervical area still showing some enlarged necrotic lymph nodes at Level IIB. Slight asymmetry in the thickness of the palatine tonsils was noted at the level of the uvula. 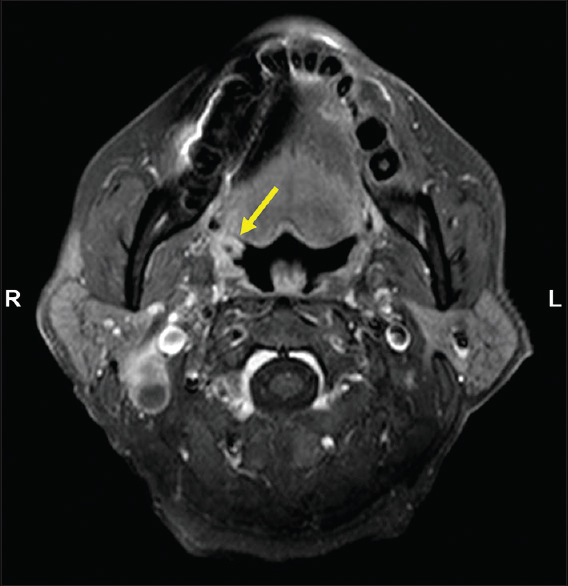 The right palatine tonsil appeared slightly more prominent without definite inhomogeneity and exhibited greater contrast enhancement than the contralateral side [Figure 3]. This was interpreted as probably nonspecific; however, because of the enlarged necrotic lymph nodes, an early neoplasm was not entirely ruled out. Tissue correlation for the right tonsil was suggested. Endoscopic biopsy of the right palatine tonsil was performed, with histopathology consistent with squamous cell carcinoma. He later underwent tonsillectomy with neck dissection. A follow-up neck CT post-surgery showed regression in the sizes of the residual lymph nodes in the right cervical area. This report focuses on an elderly male patient with recently diagnosed carcinomas of the colon and prostate, who was eventually assessed with tonsillar squamous cell carcinoma. With such previous diagnoses and atypical cells on fine-needle biopsy, the hypermetabolic enlarged right cervical lymph nodes could have been interpreted as metastases from the known primaries. However, only about 1% of all head and neck malignancies are due to metastases from a remote primary site, such as the gastrointestinal and genitourinary tracts. Thus, probability of a distant lymph node metastasis is low in this case. Hypermetabolic tonsils, in the absence of known head and neck pathologies, are typically interpreted as physiologic in nature. However, caution should be exercised for patients with FDG-avid disease in the area, as exhibited by this case. On PET/CT, the right palatine tonsil appeared more hypermetabolic than the left; on MRI, it was more prominent and more enhancing. This may still correspond to a benign pathology such as tonsillitis, which should respond to antimicrobial therapy. However, the clinical persistence of the neck symptoms despite short-course antibiotics, along with enlarged necrotic FDG-avid cervical lymph nodes, may have been enough grounds to suspect malignancy. An elevated amylase level may have also supported such pathology, as this is normally noted in organs such as the salivary glands, thyroid glands, and tonsils. A 2010 study highlighted the utility of SUVmax ratio in differentiating squamous cell tonsillar carcinoma from normal asymmetric FDG uptake. SUVmax ratio is defined as higher tonsillar SUV divided by the lower SUV. Values of 1.48 or higher were consistent with malignancy. In this patient, the SUVmax ratio was 1.5, coinciding with the said study finding. In retrospect, this may have expedited the workup toward the eventual diagnosis. Furthermore, a PET/MRI would have been more advantageous in this case due to the increased anatomic detail that MRI can provide in head and neck malignancies. However, PET/MRI is currently not yet available in the Philippines. This case report shows how normal-looking tonsillar FDG uptake on PET/CT was eventually determined to be a primary malignancy. On a background of enlarged cervical lymph nodes and known carcinomas, uptake in the tonsils should never be quickly dismissed as normal or inflammatory, especially with asymmetry in FDG uptake. Calculating the SUVmax ratio is advised in similar future cases to rule out a probable tonsillar primary malignancy. The authors are grateful to Dr. Jonas Francisco Y. Santiago, Department Chairman, and Dr. Patricia A. Bautista, Research Head, for inspiring research. Olaleye O, Moorthy R, Lyne O, Black M, Mitchell D, Wiseberg J, et al. A20-year retrospective study of tonsil cancer incidence and survival trends in South East England: 1987-2006. Clin Otolaryngol 2011;36:325-35. Mohandas A, Marcus C, Kang H, Truong MT, Subramaniam RM. FDG PET/CT in the management of nasopharyngeal carcinoma. AJR Am J Roentgenol 2014;203:W146-57. Davison JM, Ozonoff A, Imsande HM, Grillone GA, Subramaniam RM. Squamous cell carcinoma of the palatine tonsils: FDG standardized uptake value ratio as a biomarker to differentiate tonsillar carcinoma from physiologic uptake. Radiology 2010;255:578-85. Yegneswaran B, Pitchumoni CS. When should serum amylase and lipase levels be repeated in a patient with acute pancreatitis? Cleve Clin J Med 2010;77:230-1. Szyszko TA, Cook GJ. PET/CT and PET/MRI in head and neck malignancy. Clin Radiol 2018;73:60-9.